Most bones in the human body are connected to other bones through joints but, there are some bones that are not connected to other bones at all. These bones are called sesamoids and they are connected only to tendons or are embedded in muscle. The big toe joint contains two sesamoid bones (each about the size of a kernel), the tibial and the fibular sesamoids. These bones serve two very important functions. They protect the large tendon to the big toe, which pulls the toe to the ground during activity and, they serve as a fulcrum for the short flexor tendon, which stabilizes the toe as it pushes off the ground during activity. 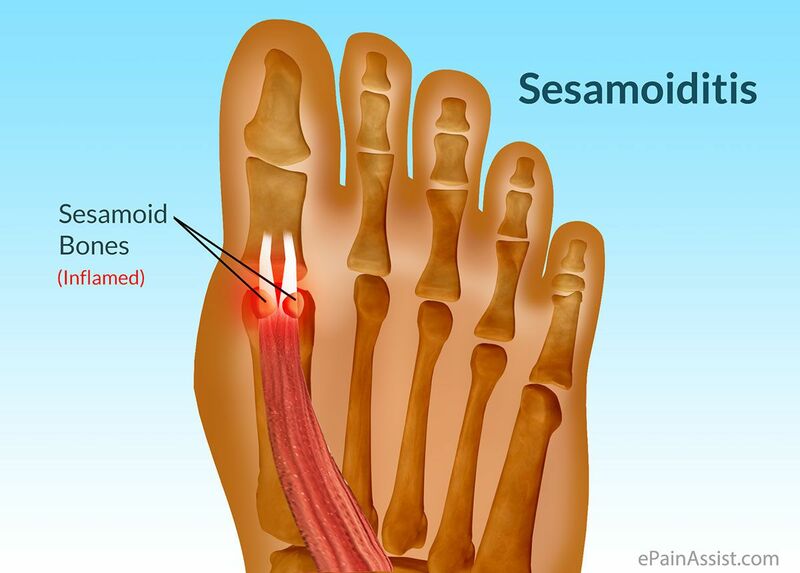 Like other bones, sesamoid bones can fracture and the tendons surrounding the sesamoids can become irritated or inflamed. This is called sesamoiditis, which is a form of tendonitis. This injury is very common among ballet dancers, runners, baseball catchers, and among those who wear high heeled shoes with little cushioning or have a high-arched foot type. During an examination your podiatrist will look for tenderness at the sesamoid bones. To do this your foot doctor may manipulate the bone slightly or ask you to bend and straighten your large toe and look for intensified pain. The podiatrist will also request X-rays of the forefoot to ensure proper diagnosis. When fractured, the smooth sesamoid bones become jagged making an X-ray extremely useful in identifying a fracture but, since these bones are so small and diagnosis can be difficult, an additional bone scan could be requested as a follow up. There are various forms of treatment for sesamoiditis and most of them are directed at minimizing the inflammation of the tendons. This may include: resting, applying ice, taking anti-inflammatory medications and physical therapy. More resistant cases of sesamoiditis can be treated with calf muscle stretching, a cam-walker removable cast, and cortisone injection (only for inflammatory cases that don’t involve a fracture). If a fracture in the sesamoid exists, your podiatrist will ask you to wear a stiff-soled shoe or a short, leg-fracture cast. The foot doctor may also tape the joint to limit movement of the large toe and suggest the use of pads or other orthotic devices. Surgery is rare but if conservative care fails to render the patient pain free, removal of the sesamoid bone is a consideration.